This book analyses the relationship between law and violence, the utility of law over violence and whether legality as an approach has an inherent disability in addressing mass violence as a crime. The study is located within international law and assesses whether prosecuting political violence would necessarily entail an abuse of the legal process. The intention is to encourage definition of criminal aggression via legal processes laid down by the International Criminal Court, rather than giving favour to political action under the United Nations Charter. Issues discussed in the book include the controversies over the location of the crime of aggression in either law or politics, taking a legal approach to the problems outlined. Using examples from Libya, the Ivory Coast, and Kenya, the work will be of interest to those working in the areas of international criminal justice, international law, legal theory, and international relations. 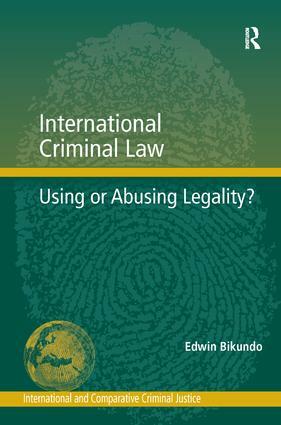 Edwin Bikundo is a Lecturer at the School of Law at Griffith University in Brisbane, Australia. He has teaching and research interests in international and comparative law and critical legal theory. His current research focuses on the role of the international criminal trial in preventing the reoccurrence of violence.